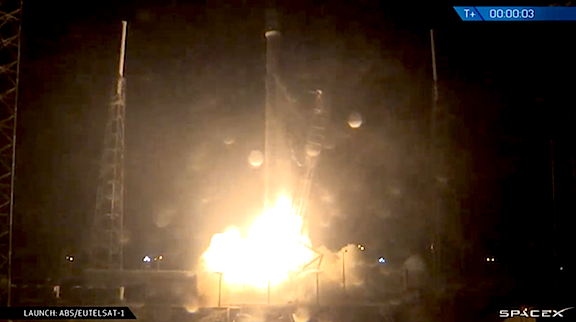 [SatNews] On March 1, 2015, SpaceX’s Falcon 9 rocket delivered the ABS 3A and EUTELSAT 115 West B all-electric satellites to a supersynchronous transfer orbit. 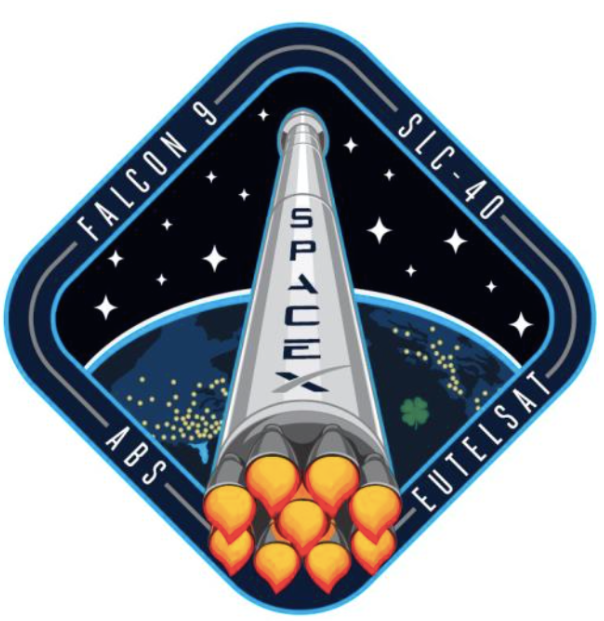 Marking Falcon 9’s sixteenth launch and the vehicle’s most voluminous payload to date, the liftoff occurred at 10:50 pm EST from SpaceX’s Launch Complex 40 at Cape Canaveral Air Force Station, Florida. Liftoff occurred at the front of the launch window, with Falcon 9’s nine Merlin 1D engines putting out 1.3 million pounds of thrust, rising to 1.5 million pounds as the stage climbed out of Earth’s atmosphere. Approximately three minutes into flight, the first stage engines cut off and the first and second stages separated. Shortly thereafter, the second stage’s single Merlin Vacuum engine ignited to complete a five-minute burn. Twenty-five minutes into flight the engine restarted to complete a one-minute burn to bring the satellites to orbit. Thirty minutes into flight, the ABS 3A satellite deployed into a supersynchronous transfer orbit followed by EUTELSAT 115 West B approximately five minutes later. The satellites will then fire their thrusters to reach geosynchronous orbits. As the world’s first all-electric propulsion satellites, they carry no liquid propellant, rather, they reach orbit entirely via a lighter and more efficient electric propulsion system. ABS 3A will be located at 3 degrees West and will connect the Americas, Europe, Africa and the Middle East. 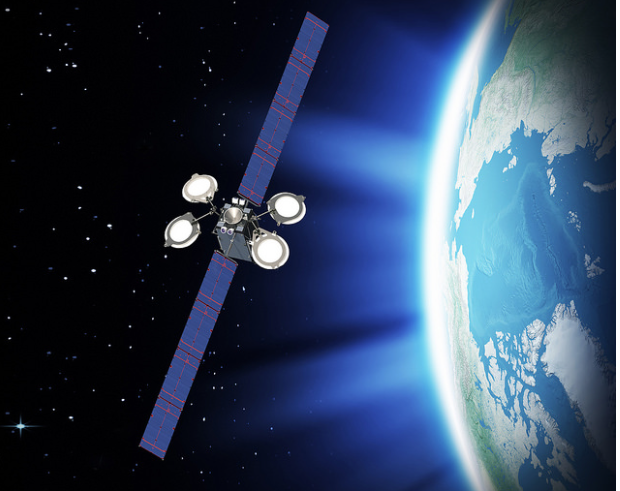 EUTELSAT 115 West B will be located at 114.9 degrees West and will provide coverage from Alaska and Canada to South America. SpaceX’s next launch is targeted for approximately three weeks from now, from Cape Canaveral, Fla. The satellites will be used by French satellite provider Eutelsat and Asia Broadcast Satellite, SpaceX said in a statement. Because the satellites are the first fully electrically-powered ones to be launched, are powered by xenon-ion thrusters, making them much smaller than conventional satellites, which enabled the company to load two satellites on to one rocket. The xenon-ion propulsion engine harnesses magnetic fields instead of rocket fuel for propulsion. As the payload would be delivered at an altitude of over 23,000 miles, taking enough fuel proved a challenge, SpaceX said, adding that it did not equip the rocket with landing legs and does not intend to try landing the first-stage booster rocket as it had tried to in the past. The fuel, which would have been used for landing maneuvers, would instead be used to reach high orbit. Eutelsat’s satellite will provide video, data, government and mobile service throughout the Americas, replacing an older satellite and providing superior signals, space news website NASA Spaceflight reported. Asia Broadcast Satellite’s payload will distribute television programming, Internet, and mobile and maritime communications around the world.